Sometimes you want to move a file or folder from another computer to your Mac. And every time you want to change the information, move it or change it in any way it wants you to give Admin permission. This is because the permissions for whatever reason are set to Read only. A good way to check is to see if you can rename it by clicking on the name. If you can’t it’s probably Read only. 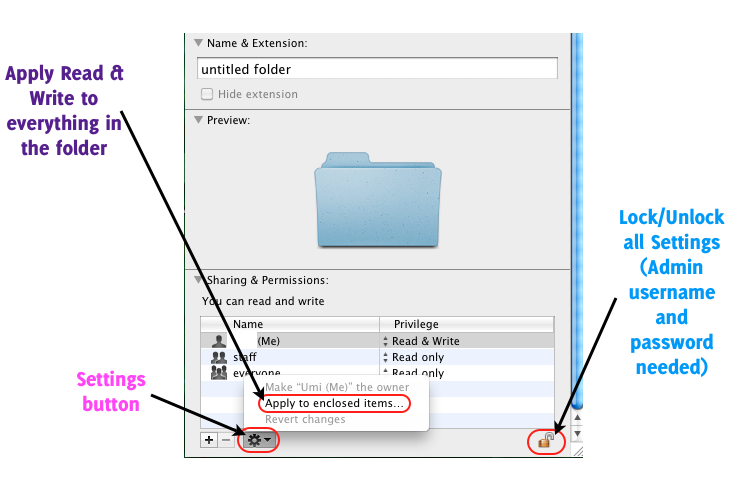 You can also check by right clicking on the file or folder and clicking Get Info. 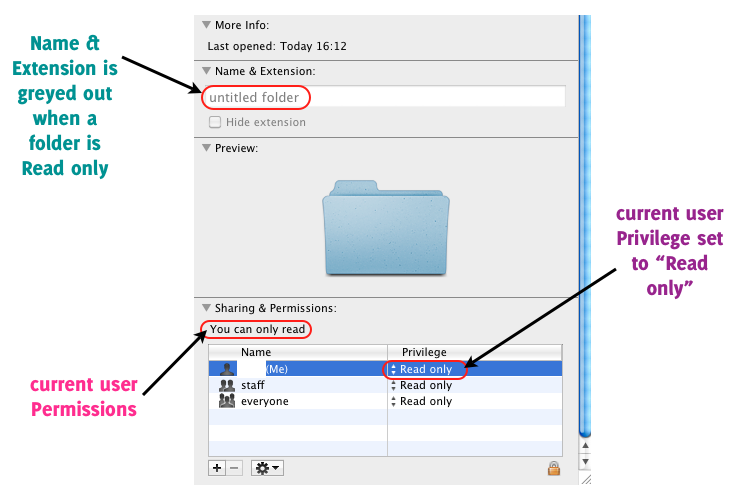 Check the Sharing & Permissions at the bottom of the window. To change your Permissions/Privileges just click where it says Read only and change the settings to Read & Write. So method a.) is fine for one or two files or folders but what if you have ten or twenty or a couple of hundred? For months I did this painstakingly for each file and folder, muttering dark curses against stupid user privileges for ordinary files… until I found out that there is actually a way of doing this!!! Now you can change the name and extension of all the files in that folder and move them wherever you want without being asked for your Admin details all the time. Hurrah! Thank you Sooooooooo much! Apple is picking their noses too much to make it obvious or intuitive on how to do this. This was a huge help to me today! THANK YOU for this!! It’s been driving me crazy for years!